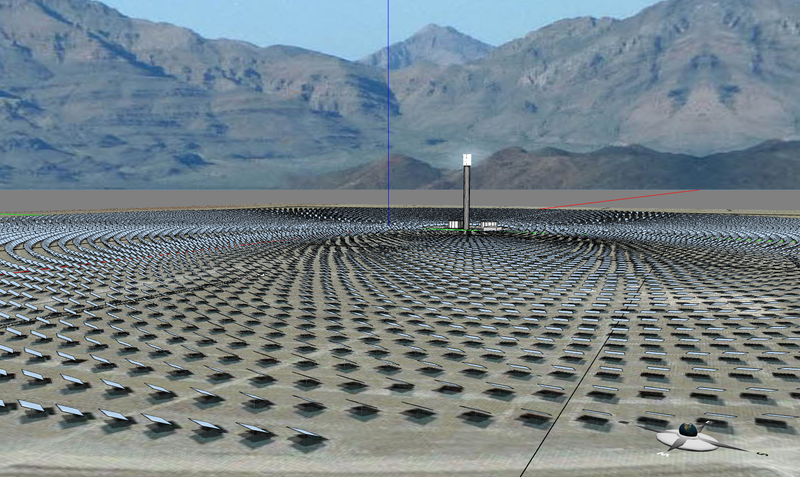 The Crescent Dunes Solar Power Tower is a 110 MW utility-scale concentrated solar power (CSP) plant with 1.1 GWh of molten salt energy storage, located about 190 miles northwest of Las Vegas in the United States (watch a video about it). 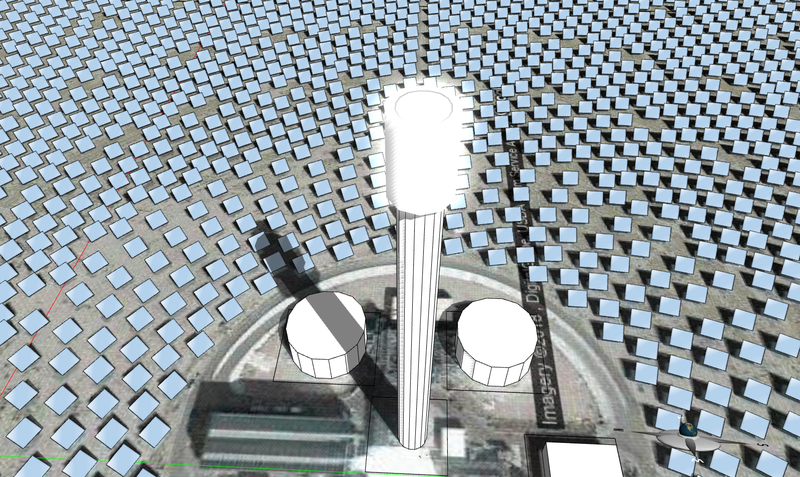 The plant includes a whopping number of 10,347 large heliostats that collect and focus sunlight onto a central receiver at the top of a 195-meter tall tower to heat 32,000 tons of molten salt. The molten salt circulates from the tower to some storage tanks, where it is then used to produce steam and generate electricity. Excess thermal energy is stored in the molten salt and can be used to generate power for up to ten hours, providing electricity in the evening or during cloudy hours. Unlike other CSP plants, Crescent Dunes' advanced storage technology eliminates the need for any backup fossil fuels to melt the salt and jumpstart the plant in the morning. 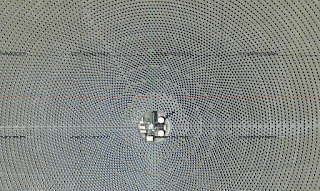 Each heliostat is made up of 35 6×6 feet (1.8 m) mirror facets, adding up to a total aperture of 115.7 square meters. 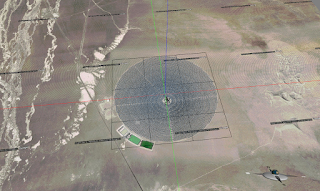 The total solar field aperture sums to an area of 1,196,778 square meters, or more than one square kilometer, in a land area of 1,670 acres (6.8 square kilometers). That is, the plant is capable of potentially collecting one seventh of all the solar energy that shines onto the field. Costing about $1 billion to construct, it was commissioned in September 2015. 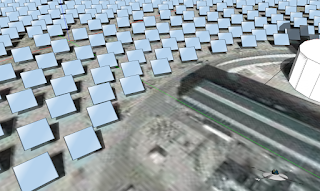 Since its inception in January 2018, our Virtual Solar Grid has included the Energy3D models of nearly all the existing large CSP power plants in the world. 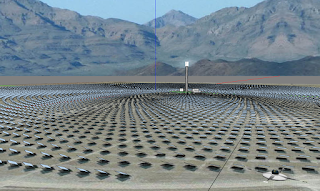 That covers more than 80 large CSP plants capable of generating more than 11 TWh per year. 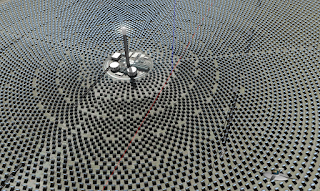 The ultimate goal of the Virtual Solar Grid is to mirror every solar energy system in the world in the computing cloud through crowdsourcing involving a large number of students interested in engineering, creating an unprecedentedly detailed computational model for learning how to design a reliable and resilient power grid based completely on renewable energy (solar energy in this phase). 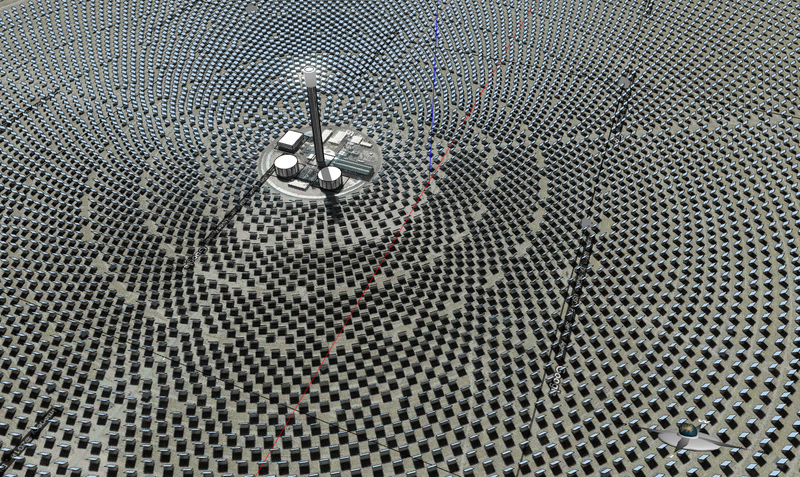 The modeling of the Crescent Dunes plant has put our Energy3D software to a stress test. 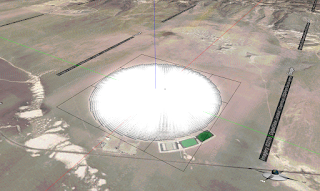 Can it handle such a complex project with so many heliostats in such a large field? This became my President's Day project. To make this happen, I had to first increase the resolution of Google Maps images supported in Energy3D. A free developer account of Google Maps can only get images of 640 × 640 pixels. When you are looking at an area that is as big as a few square kilometers, that resolution gets you very blurry images. To fetch high-resolution images from Google without paying them, I had to basically make Energy3D download many more images and then knit them together to create a large image that forms an Earth canvas in Energy3D (hence you see a lot of Google logos and copyrights in the ground image that I could not get rid of from each patch). 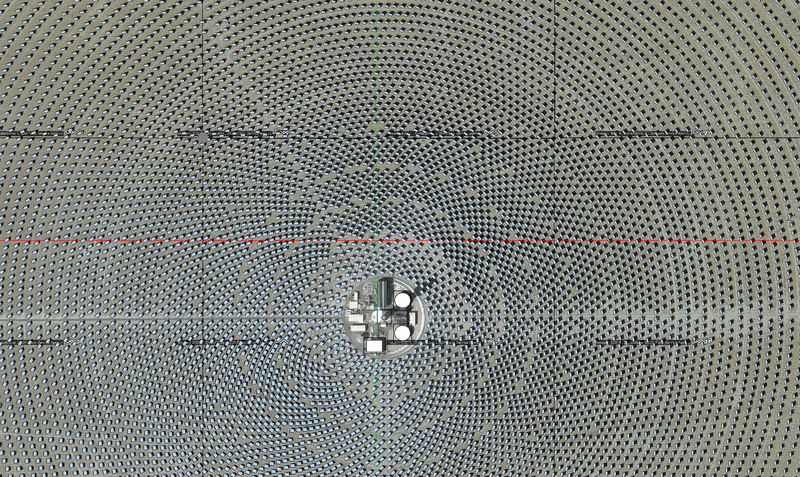 Once I had the Earth canvas, I then drew heliostats on top of it (that is, one by one for more than 10,000 times!) 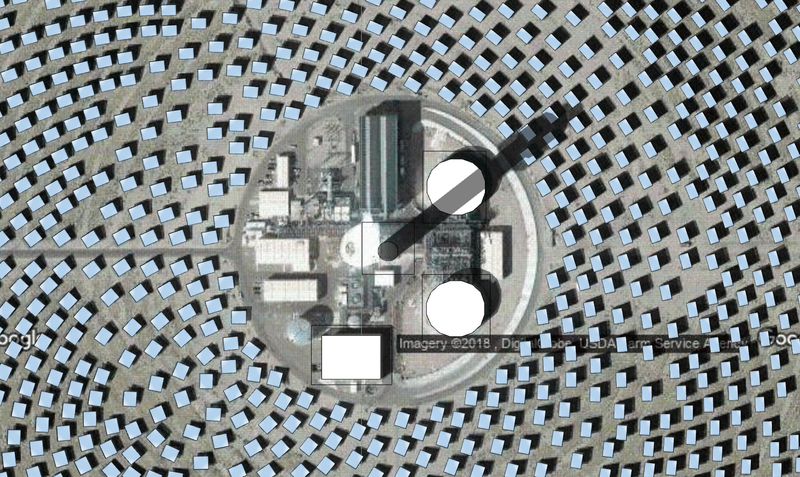 and compared their orientations and shadows rendered by Energy3D with those shown in the Google Maps images. Now, the problem is that Google doesn't tell you when the satellite image was taken. But based on the shadows of the tower and other structures, I could easily figure out an approximate time and date. 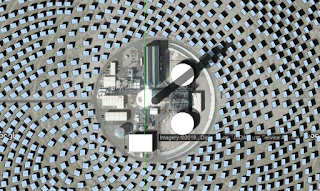 I then set that time and date in Energy3D and confirmed that the shadow of the tower in the Energy3D model overlaps with that in the satellite image. 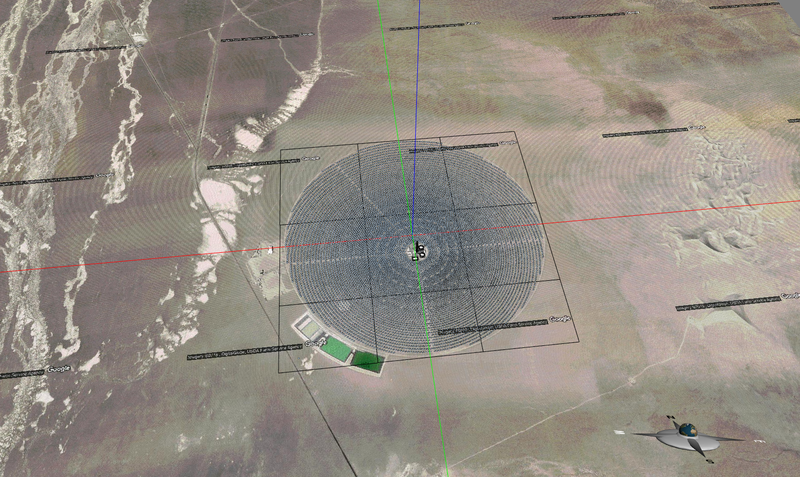 After this calibration, every single virtual heliostat that I copied and pasted then automatically aligned with those in the satellite image (as long as the original copy specifies the tower that it points to), visually testifying that the tracking algorithm for the virtual heliostats in Energy3D is just as good as the one used by the computers that control the motions of the real-world heliostats. Matching the computer model with the satellite image is essential as the procedure ensures the accuracy of our numerical simulation. After making numerous other improvements for Energy3D, the latest version (V7.8.4) was finally capable of modeling this colossal power plant. This includes the capability of being able to divide the whole project into nine smaller projects and then allow Energy3D to stitch the smaller 3D models together to create the full model using the Import Tool. This divide-and-conquer method makes the user interface a lot faster as neither you nor Energy3D need to deal with 9,000 existing heliostats while you are adding the last 1,000. The predicted annual output of the plant by Energy3D is 462 GWh, as opposed to the official projection of 500 GWh, assuming 90% of mirror reflectance and 25% of thermal-to-electric conversion. One thing I had to do, though, was to double the memory requirement for the software from the default 256 MB to 512 MB for the Windows version (the Mac version is fine), which would make the software fail on really old computers that have only 256 MB of total memory (but I don't think such old computers would still work properly today anyways). The implication of this change is that, if you are a Windows user and have installed Energy3D before, you will need to re-install it using the latest installer from our website in order to take advantage of this update. If you are not sure, there is a way to know how much memory your Energy3D is allocated by checking the System Information and Preferences under the File Menu. If that number is about 250 MB, then you have to re-install the software -- if you really want to see the spectacular Crescent Dunes model in Energy3D without crashing it. 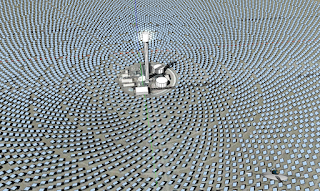 With basically only the three Ivanpah Solar Towers left to be modeled and uploaded, the Virtual Solar Grid has nearly incorporated all the operational solar thermal power plants in the world. 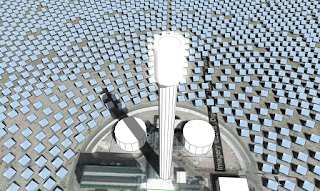 We will continue to add new CSP plants as they come online and show up in Google Maps. In our next phase, we will move to add more photovoltaic (PV) solar power plants to the Virtual Solar Grid. At this point, the proportion of the modeled capacity from PV stands at only 8% in the Virtual Solar Grid, compared with 92% from CSP. Adding PV power plants will really require crowdsourcing as there are many more PV projects in the world -- there are potentially millions of small rooftop systems in existence. On a separate avenue, the National Renewable Energy Laboratory (NREL) has estimated that, if we add solar panels to every square feet of usable roof area in the U.S., we could meet 40% of our total electricity need. Is their statement realistic? Perhaps only time can tell, but by adding more and more virtual solar power systems to the Virtual Solar Grid, we might be able to tell sooner. Everyday Inquiry with R: Is Yogurt-X Expensive?